It's round, it's red, it's a tomato. Tomatoes are probably one of the most widely-used and best-known vegetables around the world. Add them to your burgers, pasta or simply eat them as a snack -- fresh tomatoes can lend your dishes taste a certain summery taste! But keep in mind not to store your tomatoes in the fridge. They stay fresh and tasty for about two weeks, when stored outside at room temperature. 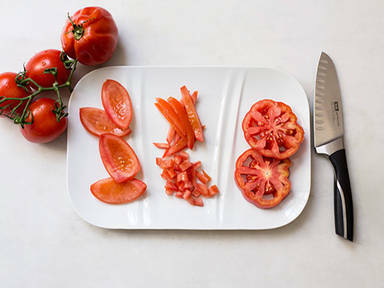 There are many ways to cut a tomato. One way is to cut them into slices, another way is to cut them in half and remove the core, then cut into small pieces. Enjoy tomatoes in your salads, sauces, sandwiches or as a snack.